We dedicate this page to the memory of Howard Steinmetz ז״ל, who did so much to help his extended Rohatyn family and friends find each other, and learn about the town that was once lost to them. The Holocaust of World War II destroyed nearly the entire Jewish population of Rohatyn and surrounding towns and villages. Post-war Soviet population exchange policies resulted in emigration or deportation of the few survivors of the Rohatyn wartime ghetto together with most remaining ethnic Poles. By 1947, only two surviving local Jews remained in the Rohatyn area, neither of them in Rohatyn itself and both living with false identity as non-Jews. 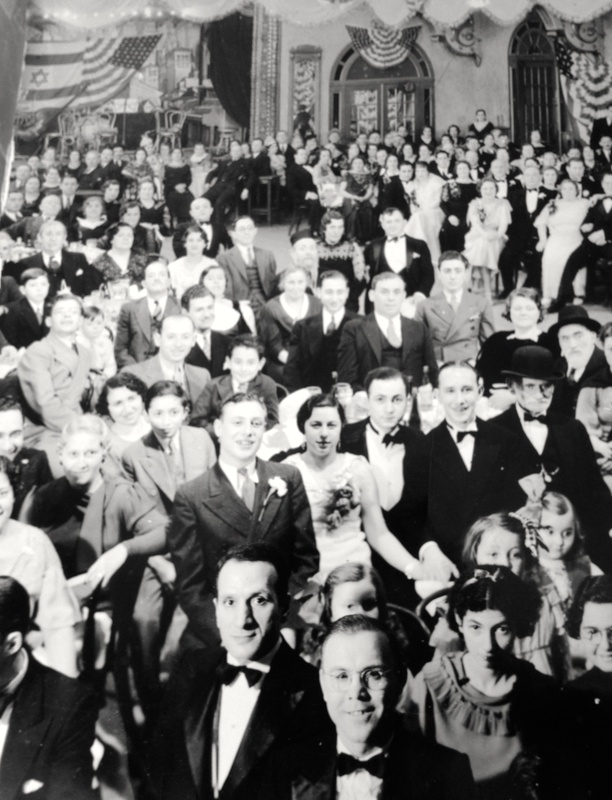 Although there is no Jewish life in the town today, the Rohatyn Jewish community continues to thrive and grow abroad through descendants of the families who once called Rohatyn home, and some now return to Rohatyn to visit the heritage sites and to walk the streets of their ancestors. 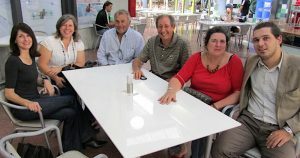 Rohatyners from Europe, Israel, and North America meet in Paris (2012). Occasional emigration from Rohatyn and the region by individual Jews and Jewish families has been ongoing since at least the 19th century, and continued through the 1930s. Some local Jews emigrated for better work and school opportunities; others to evade the devastating wars; some to find more hospitable environments in which to practice their religion; some, probably, just for the adventure. Of course, except for forced Russian deportations during World War I, most Rohatyn Jews stayed in town with their families and were content to prosper there as best they could. Rohatyners at dinner together in Warsaw (2018). Even before World War II, Jewish Rohatyners who chose to leave scattered near and far, wherever trains and ships could take them. Strong early Jewish national revival and Zionist youth training groups in Rohatyn in the interwar period led many local Jews to look toward British-controlled Palestine as a future home, for social and religious reasons, well before the post-war establishment of the state of Israel. Economic opportunities made the United States a popular destination; when US immigration quotas restricted incoming Jews and others based on national origin, other destinations rose in relative importance, especially Argentina, which had long had welcoming immigration policies. 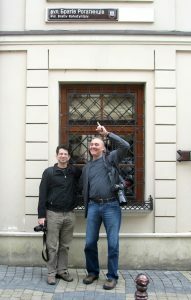 Descendants on “Rohatyn Brothers Street” in Lviv (2011). The exact number of survivors of the Shoah in Rohatyn is not known, but was probably fewer than five percent of the pre-war Jewish community in town. The percentage was even smaller when the surrounding towns and villages are included (from which all Jews were moved to the ghetto in Rohatyn in 1942-1941), as well as Jewish refugees who had fled to Rohatyn before 1941 from Nazi occupation in the west of Poland. When the Soviets pushed the German army out of Rohatyn, a few Jews who had survived in the forests for more than a year were drafted into the Red Army to serve in the closing battles of the war, and then in civil service and rebuilding work until 1946, when resettlement across the new border with Poland peaked. A few resettled Jewish survivors from Rohatyn remained in the Polish Provisional Government of National Unity and then the Polish People’s Republic, but many chose to cross into divided and occupied Germany – legally or illegally – in order to find support as refugees in the displaced person (DP) camps there, and possible opportunities to emigrate further. Most of those who sought sponsorship and permission to move to other countries eventually obtained it, though some waited for several years after the war ended before they could go. 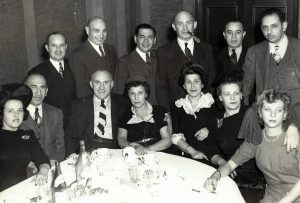 A meeting of the RYMS in New York (no date). Image courtesy Alvin Edelstein. Both before and after the war, Jews migrated from Rohatyn throughout Europe and to every other continent except Antarctica. The Jewish Genealogical Society of New York records at least three landsmanshaft organizations formed in the late 19th century with the goal of providing mutual aid to Rohatyn’s Jewish emigrants, including burial societies to purchase and maintain sections in local cemeteries, and to benefit Jews in their origin towns, and to create social circles of Jewish people in foreign lands who had emigrated from the same places. 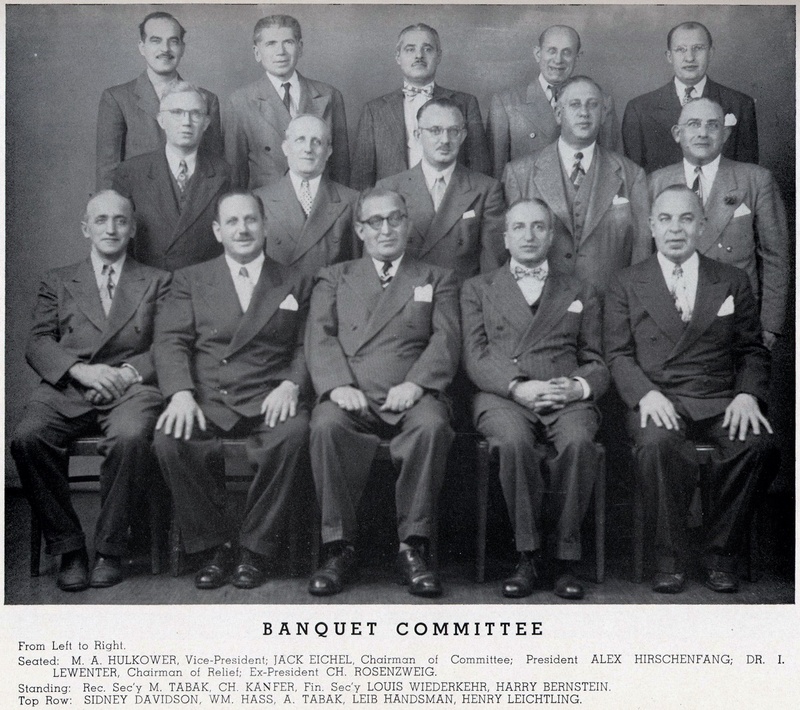 The RYMS 50th anniversary banquet committee (1953). Image courtesy Alvin Edelstein. 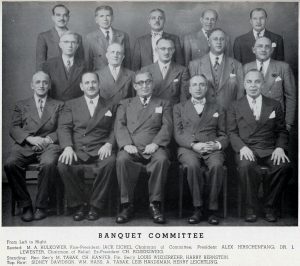 Among the organizations incorporated in New York were the “Rohatyner Young Mens Society” (RYMS), the “Independent Rohatyner Young Mens Benevolent Association” (IRYMBA), the “Chebra Tiferas Israel Anshei Rohatyn Benevolent Association”, and the “First United Rohatyner and Sokolover Society”. Landsmanshaft sections for burials of members’ families were established and maintained at Washington Cemetery (Brooklyn), Beth Israel Cemetery (Long Island), as well as Old Montefiore Cemetery, Mount Hebron Cemetery, and Mount Zion Cemetery (all in Queens); some cemeteries had sections maintained by more than one Rohatyner society. The RYMS was large enough to have its own rabbi and small local shteibel; a ladies auxiliary was established by the IRYMBA in 1934 to recognize the participation of women in the association’s benevolent work. A gala meeting of the Knihynicze Society (1936). Image courtesy Irving Busgang. Not only Rohatyn was represented in these groups; landsmanshaften also formed for emigrants from other towns in the area with sizable Jewish populations. Jews from Knihynicze (today Kniahynychi), 10km west of Rohatyn, formed at least two mutual aid societies before 1900, incorporating them in a variety of names and languages over the next decades. One, the “Jehuda-Arje Knihinitzer Unterstützungs Verein” and later the “First Consolidated Kinheniczer Reverend Jehuda Arje Sick and Benevolent Association”, also established burial grounds in Mount Zion Cemetery, and held regular meetings in New York which were enthusiastically attended. Associations also formed to support Jewish expatriates from Brzeżany/Berezhany, Bóbrka/Bibrka, Bołszowce/Bilshivtsi, Bukaczowce/Bukachivtsi, Chodorów/Khodoriv, and Żurawno/Zhuravno; it seems the old shtetl world was nearly reproduced in the new world. While most of these societies have since dwindled and ceased to meet, including those focused on Rohatyn, the landsmanshaft sections in New York and nearby cemeteries are still maintained by other groups or by cemetery staff. The Rohatyner Young Mens Society continued to meet at least through 2008. 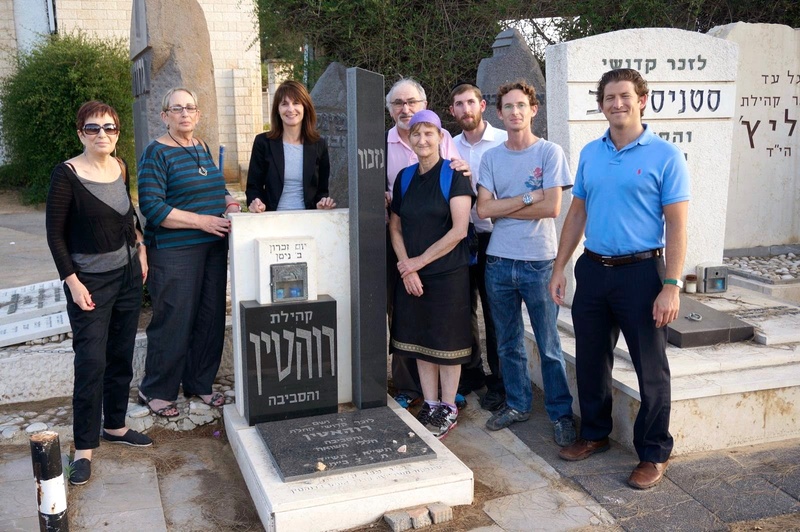 Rohatyners gathered at the cemetery memorial in Kiryat Shaul (2014). In addition to New York landsmanshaften, survivor organizations also formed in the new state of Israel after World War II. In 1949, the “Society of the Rohatyner in Israel” (Irgun Yotzei Rohatyn V’Hasviva B’Yisrael, or Israel Society of Rohatyn) was established to commemorate the victims of the Holocaust in Rohatyn and surrounding areas and to provide support to needy survivors from the region. In 1960, the Society buried sacks of earth from Rohatyn at a symbolic grave and memorial in Kiryat Shaul Cemetery in Tel Aviv, and in 1962 assembled and published the Rohatyn Yizkor Book as a memorial in written form for the lost Jewish community. The Society continued its benevolent and commemorative activities for decades. Between 1997 and 1999, Society leaders visited Rohatyn several times in order to install memorial monuments and signage at the two wartime mass graves and the two cemeteries, and to organize the rehabilitation of retaining walls and fencing at the old cemetery; the 1998 commemoration event brought Jewish survivors and descendants from Israel, America, and Europe. With the passing of nearly all Rohatyn ghetto survivors in Israel, the Israel Society has now ceased to meet. Rohatyners meeting in Córdoba, Argentina (2010). New awareness and study of Rohatyn’s Jewish past has grown in the past decades with the rising interest in genealogy, and has been given a considerable boost by the versatility of the internet and social media. Online bulletin boards, forums, and email gave family historians improved ways to connect with each other, share text and graphic data, and reach out to others with common family origins. Jewish genealogy organizations became particularly numerous and strong; the global organization JewishGen has been operating for more than 30 years, and the regional organization Gesher Galicia for more than 25 years. These organizations and others assemble searchable databases, provide tools and guidance, and direct funds to special research projects. 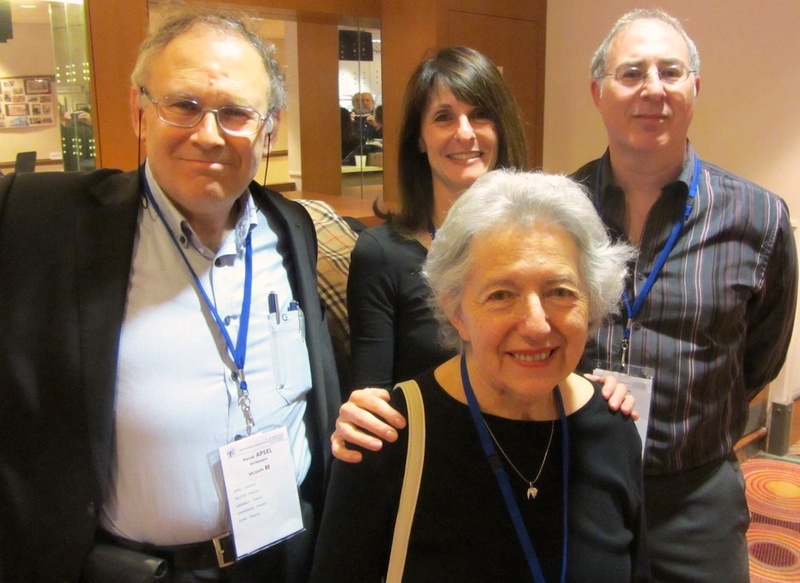 In addition to membership organizations which maintain data, websites, and email forums, an umbrella organization called the International Association of Jewish Genealogical Societies (IAJGS) has been holding annual international conferences since the 1980s, providing family historians an opportunity to meet and learn together. 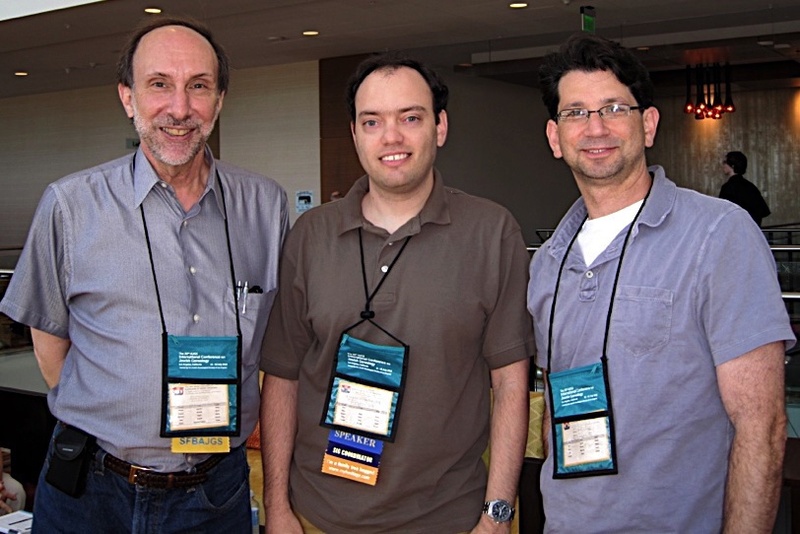 Early RSRG leaders in Los Angeles (2010). In 2008, the Rohatyn-focused special interest group “Rohatyn Shtetl Research Group” (RSRG) was founded by Dr. Alex Feller, a Rohatyn descendant, with the support of several other descendants and interested historians he met at the IAJGS conference in Chicago that year. Building on a forum and website Alex created early the next year, the RSRG now numbers more than 350 members, many of them very active, with more contributing through family connections; the scope of the research now also includes several other towns in the Rohatyn district. The RSRG sparked an immediate revival of a landsmanshaft-like social network interested in sharing records, images, and stories from Rohatyn’s Jewish community; the group’s private database, plus the research and computer skills of many members have made the RSRG an essential resource for anyone with an interest in Jewish Rohatyn. Rohatyners visiting their ancestral town (2017). 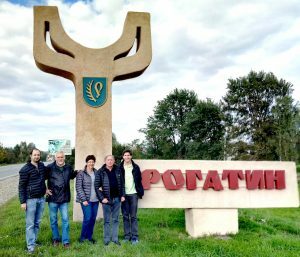 Renewed interest in Rohatyn family history has also prompted more people to make a journey to the town, some for repeat visits and even to stay overnight. Individual Jewish descendants and smaller groups have visited Rohatyn since before Ukraine’s independence in 1991, and increasingly since the RSRG began. Most who travel to Rohatyn visit the Jewish heritage sites and the places where their families lived, interact with the current residents and historians of the town, and in some cases meet witnesses of the last years of the Jewish community. The ongoing history and heritage preservation project “Rohatyn Jewish Heritage” described on this website grew out of a series of such visits and meetings beginning in 2011. Migration has spread Jewish Rohatyners all over the world, but despite long distances between them, modern communication and travel makes them better connected than ever before. 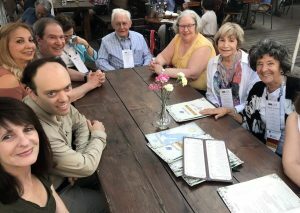 In addition to virtual gatherings, descendants of Rohatyn Jewish, Polish, and Ukrainian families meet in person from time to time in Rohatyn, at genealogy conferences in North America, Europe, and Israel, and especially on occasional visits almost anywhere, like the family and neighbors they have always been. The map below shows some of the places where Jewish Rohatyners live today, and gives an instant picture of how far they have traveled over the past century and more. We know this map is incomplete; let us know if you also have a Rohatyner as a neighbor! Substantial sources of information on this page include research by Dr. Alex Feller, founder of the Rohatyn Shtetl Research Group (RSRG), and by Phyllis Kramer, VP of Education for JewishGen and manager of the Rohatyn Kehilalinks web page. Rohatyn Jewish Heritage thanks Alex and Phyllis for their ongoing family history research on Jewish Rohatyn and for their kind permission to use the results of their research here.